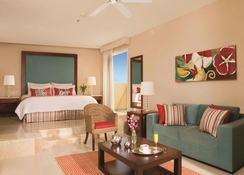 Set on a gorgeous Caribbean beach in Puerto Morelos, Now Jade Riviera Cancun beckons tourists with a private beach area, luxurious suites with magnificent sea or jungle views and a medley of fantastic hotel facilities. This chic hotel has three outdoor pools, eight restaurants, bars and a relaxing hydrotherapy spa. 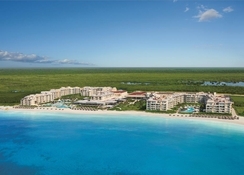 Welcoming guests of all ages, this family-friendly resort redefines luxury with a stunning pure crystal white sand beach and refreshing turquoise waters. Kids and teens can keep themselves busy at the supervised Explorer’s Club, looked after by Red Cross certified staff. As part of the Unlimited-Luxury package, guests can enjoy unlimited food and beverages, 24-hour room and concierge services, stocked minibar, pool and beach wait service and access to all entertainment venues. 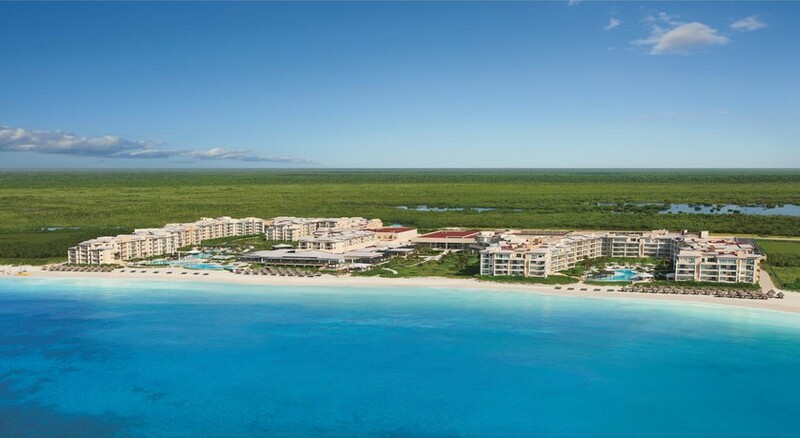 Located on a private beach of Puerto Morelos, Now Jade Riviera Cancun is adjacent to a golf course and the Ojo de Agua Beach is 3km away. Puerto Morelos Town Square and the Artisans Market are also a short walk away at 3km. 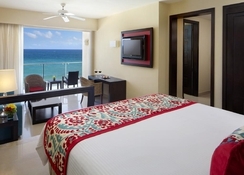 Now Jade Riviera Cancun offers 550 ultra-comfortable suites, furnished in a contemporary style with views of the turquoise sea and Cancun’s tangerine sunsets. The air-conditioned rooms have a private terrace or balcony and come with king-size or twin double beds, marble floors, en-suite bathrooms with hydrotub, hair dryer, Gilchrist & Soames toiletries, bathrobes & slippers, minibar, satellite TV, Alarm Clock, iPod docking station, telephone, coffee/tea maker, safe, electronic keyhole and 24-hour room service. In addition, guests can choose the Preferred Club membership and enjoy an upgraded suite, lounge access and exclusive privileges. 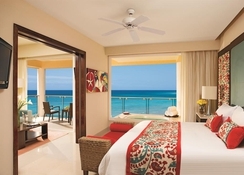 The rooms come in categories of Junior Suite Tropical View, Junior Suite Ocean View, Junior Suite Ocean Front View, Family Suite Tropical View, Preferred Club Suite Ocean View, Preferred Club Suite Ocean Front View and Preferred Club Governor Suite. 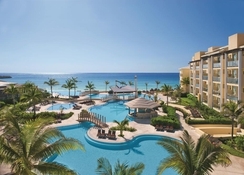 At Now Jade Riviera Cancun guests can indulge their palate by choosing the Unlimited-Luxury package, which gives access to buffet meals or gourmet à la carte cuisine in its various restaurants without reservations. There are exquisite restaurants such as Cin Cin for Mediterranean cuisine and private dining, Capers for fine Italian cuisine, Castaways for sandwiches and gourmet favourites, Carnival for International buffet, Mercure for French cuisine, Spice for Asian cuisine, Tamarindo for Mexican cuisine and Barefoot Grill for grilled favourites served poolside. Guests can avail beach and swim-up pool bars waiter services too. The all inclusive package covers all food, drinks and beverages. 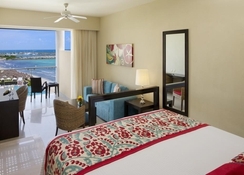 Now Jade Riviera offers many options for guests to relax and recharge. Guests may tee off at a local golf course or perfect serves at a tennis school, or enjoy watersports like kayaking, snorkelling and train at the PADI scuba diving centre. For kids and young adults, there are clubs with activities ranging from camping, arts and crafts and watching films on the beach. There is also sizzling entertainment in the form of live music, cocktail parties and shows.